I love it when a client embraces their newly designed space and continues to collect items that reflect their personality. You know, the client who switches things up a bit for a new season, or just because. Such is the case with our fab client Meagan, aka MsGlamSugar, whose home we designed here and here. When I first met Meagan, it was clear she had some amazing style. I even asked her why the hell she called me for help? But thankfully she did and I've been happy to not just help turn up the glamor in her home, but we've fast morphed from client/designer to become good friends. 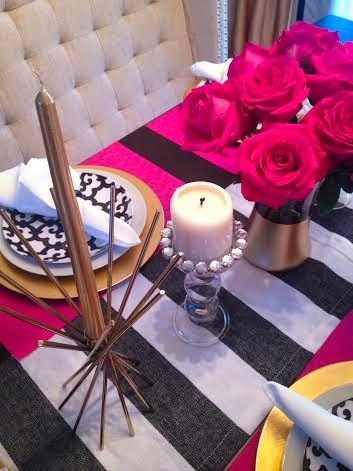 So I stopped dead in my tracks when I saw how fun and fab she'd recently styled her dining room table. Hello, she had me at hot pink place mats. This is how we left things back in December. Some serious black and gold glam, if I may say so myself. But to add some color for the summer she recently styled her table like this: A blue and white runner adds a hint of coastal flair but the setting remains glam with gold chargers, black and white plates and candle holders in different shapes and finishes. She scores extra points by adding fresh flowers to said vase. Y'all know how I feel about fake flowers. A huge, HELL no. Layers, mixed patterns and textures are key to a great table setting and Meagan nailed that here layering pink, gold, and black and white. She's also a bargain hunter. The runner she found at HomeGoods on clearance for under $10. I sourced the gold candle holders and candles from HomeGoods as well. The glass candle holders are from the Hobby Lobby and were just $3.50. The napkin rings were a $1. Sidebar - Hobby Lobby is new to South Florida and Meagan and I are both shocked that we'd never heard of them until recently - another fab client Janeka alerted me over on IG a few weeks ago. I have yet to go because when I do, I foresee loading up with a gazillion items and I need to make room in my garage (I can't believe I now have a garage!) to hoard it all. And there you have it. 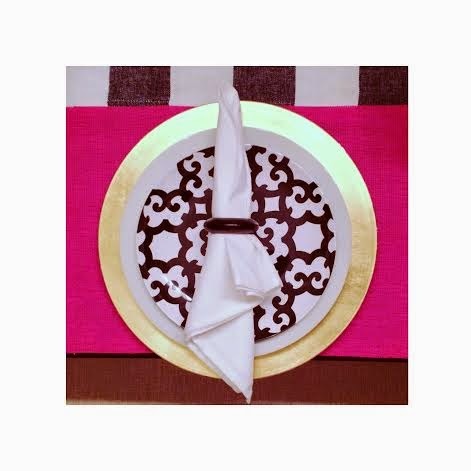 A colorful, classic and fun tablescape for a very glamorous client done by said glamorous client. She did her thing and made me proud. If you've been rocking out your tablescape for the summer or for any season or reason, feel free to share a pic or tag me on Instagram and I may just feature it here on the blog. Holla. Holla. Holla. Thanks again for sharing Meagan! Love the room. Of course I'm in love with blacks, golds and mirrors!!! That looks amazing!! Love the color scheme! Lovely considered home, sadly it will require a lot of baby proofing. Love the light and volume of the space. Thanks for the peak inside this home. 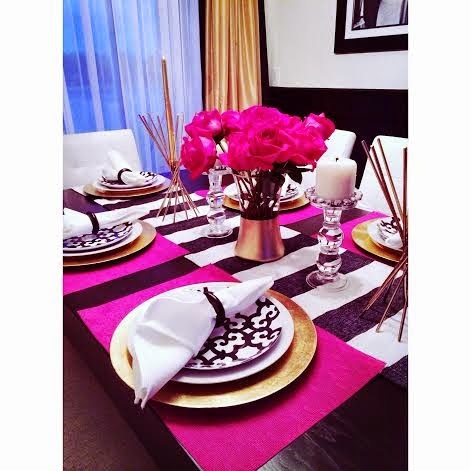 love the pink and love love the layers and patterns - a perfect table for a perfect evening! Beautiful layers! Loving the splash of pink too!